Georgia has twenty nine schools currently working towards implementing Elementary Agricultural Education in the pilot program. Representatives from each of these schools along with Georgia Ag Ed State staff are working on curriculum standards. Please contact Billy Hughes for more information on the Elementary Ag Ed program in Georgia. Starting this week, many students at Thomas County Central High School are trading books for shovels. The school is excited for their new outdoor classroom, a plot of longleaf pines. Tall Timbers, Georgia Forestry and International Forest Company partnered together to bring the special project to their first Georgia high school. The Longleaf Learning Landscape plans to integrate a new way of learning, while helping the longleaf pine ecosystem. 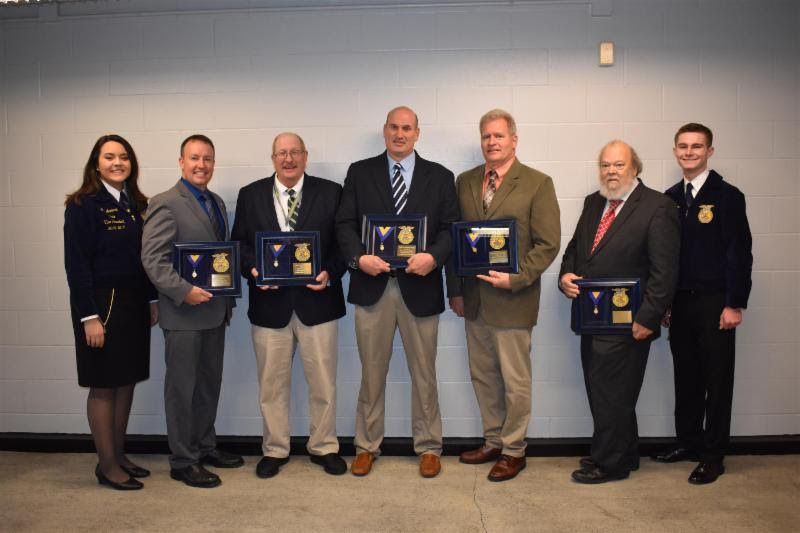 The National FFA recognized alumni members and supporters recently with the Honorary FFA Degree during the National FFA Convention in October. There were 7 individuals recognized from Georgia. The members/supporters recognized include: Josh Allen, Chip Blalock, Johnny Jones, John Seginak, Michael Bushey, Lynne Cook and Andy TenHuisen. Congratulations to these awesome supporters of FFA! The 91st National FFA Convention was held in Indianapolis, IN on October 23-27th. The convention not only had a record attendance, including a concert performance by Garth Brooks and keynote address from the President of the United States, Donald J. Trump. Some highlights of Georgia FFA members in at the convention include 19 national winners, 23 3-Star chapters, 134 American Degree recipients, an American Star finalist and 7 Honorary American Degree recipients. Please feel free to share the Press Release. Georgia has 32 national Agriscience Fair finalists; 25 national Proficiency Award finalists; and 23 national 3-Star chapters. We also have 4 chapters identified as National Finalists in the Outstanding Middle School category and 2 chapters identified as National Finalists in the Models of Excellence category. 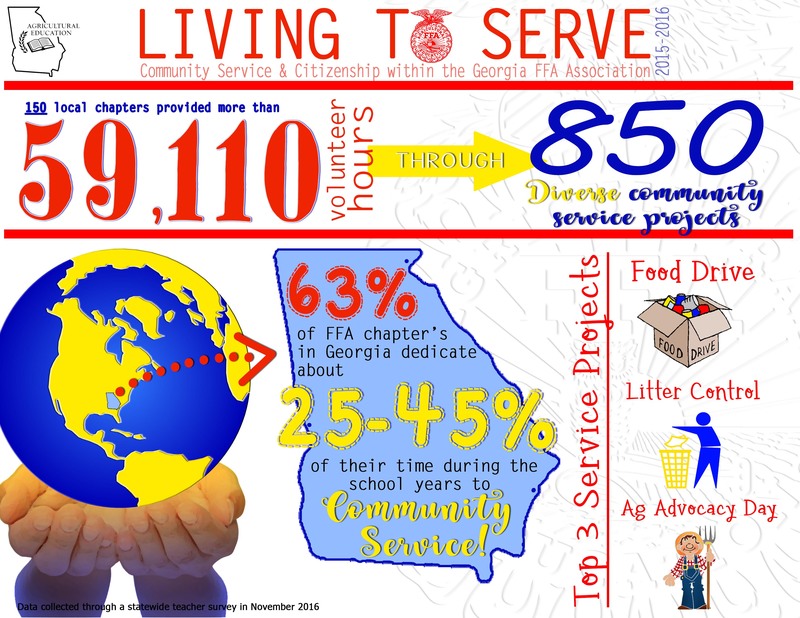 How is your FFA chapter making a difference in your community? Day of Service Mini-Grants are available to middle school, high school and alumni chapters to make a difference in your community in one of four focus areas: Community Safety; Hunger, Health and Nutrition; Environmental Responsibility & Community Engagement. Applications are accepted on a rolling basis on the first of each month. To learn more about the Day of Service Mini-Grant, visit the Living to Serve Grants website. Georgia SB330 - Elementary Ag Program Applications due June 30th! We are excited to post the Elementary Ag Program Application! Please check this link for more information. Please contact Mr. Bridges, Mr. Corzine, Mr. Mitchell or Mr. Tucker with any questions. The applications deadline is June 30th, 2018. Congratulations to 43 Georgia FFA members who have been awarded National FFA scholarships with a total of $58,000 in scholarships. Click WATCH AGAIN to start watching, then click the arrows on the right or left on the side of the screen to watch the Sessions you want to see. Over 650 AgEd students participated in a 2017 Day of Service for the city of Macon before the Georgia State FFA Convention. Click on the infograph below to learn more about the impact Georgia FFA had in Macon with the 2017 Living to Serve Community service project. Next week, FFA members will meet again in Macon prior to the 1st general session of the 90th Georgia State FFA Convention for a day of service in Macon, GA.
American Degree Applications due May 15th! 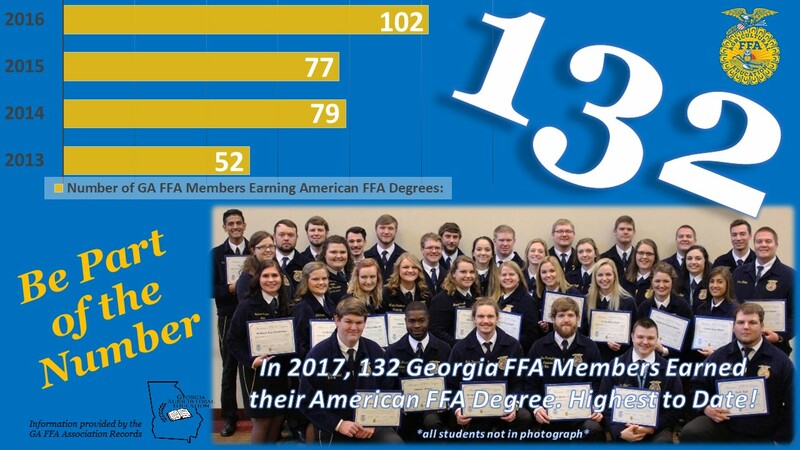 The growth in number of Georgia FFA members receiving the American FFA Degree has been awesome to witness. Can we reach 200 members this year? Please submit your application by May 15. Georgia Agricultural Education Area Teacher Program is essential for our program growth! Georgia AgEd is fortunate to have a dedicated group of Technical Area AG Teachers that support the greatest model of educational delivery. Thanks to everyone that supports this program! We are proud to announce the recipients of the 2018 Washington Leadership Conference scholarships. A big THANK YOU goes to the Georgia FFA Foundation for finding ways to get funding for so many Georgia FFA members to attend this life-changing event at very little cost. If you have students who want to attend WLC, but did not receive a scholarship, there is still room on the bus! We also have advisor spots still available, so please let us know and secure your seats soon. Congratulations to the 2018 Georgia FFA state Star finalists. These students have excelled in their Supervised Agricultural Experience (SAE) to the point that they are not only qualifying for the state FFA degree, they are considered Stars! Congratulations to these students, their families and their FFA advisors for this tremendous accomplishment. The 90th Georgia FFA Convention is only 56 days away! As you make your plans to attend the convention, the State Convention page is full of information. The online convention registration site will close at 11:59 p.m. on Sunday, April 1. Happy National FFA Week! Georgia FFA is having an Instagram challenge to encourage members to share the message of Ag and FFA with their friends and followers. Please encourage your students to participate in this challenge. Each day’s winner will receive some FFA gear! Our Instagram handle is @Ga_FFA and the challenges are listed below. Congratulations to the 2018 Georgia FFA Proficiency State Award Finalists. Each of these students will have the opportunity to interview on Thursday at the 90th Georgia FFA Convention. The dates for the WLC bus trip are June 18-24, 2018. The student conference fee is $1,125 and the advisor fee is $1,214. This fee covers most meals, lodging, conference material, and bus transportation. All WLC registration material is due to the State FFA Office by April 5th . A $450 deposit is due with the registration form. Do not use the Ag Career Network to register. WLC Scholarship applications are due March 1st. See Georgia FFA website for more info. Attn Middle School Ag Teachers! Thank you for your interest in the 2018 Discovery Conference. Unfortunately, we have reached capacity. If you have yet to send in your materials, you may still submit them by the deadline, but your chapter will be put on a waiting list. Teachers will be contacted who registered most recently with further information. For registration, conference details & classroom poster, please find the documents on our website. If you registered, full payment is due January 11, 2018. Congratulations to three Georgia FFA members who received SAE grants from National FFA. The three students are among only 152 FFA members nationwide who were awarded SAE grants. Each student will receive $1,000 from the sponsor listed to develop or grow their Supervised Agricultural Experience program. Daniel Highfill (Bekaert Corporation), Madison County FFA; Joshua Sell (Domino’s), Screven County FFA; Taylor Dyer (Natural Resources Systems), Heritage FFA. Congratulations to these students and their advisors! Make plans now for your FFA Chapter to partcipate in the Food Drive sponsored by the Georgia FFA Alumni. The FFA Program winning the Food Drive will also be rewarded onstage at State FFA Convention with a check for $500. Remember that all of the food you collect stays in your own community and all you bring to convention is the Food Drive Entry Form. Please see Food Drive Rules for more information. The Central Region Rally has been postponed due to factors associated with Hurricane Irma. We plan to conduct the Central Region Rallies on September 18th and 19th with the same schedule for the day's events. We have been looking forward to the rally as I know many of your FFA members have as well. This is only a delay in the hopefully fun and exciting days that are planned for the members of the Central Region. Click here for T Shirt Design Contest rules. Designs must be submitted on or before Sun, Sept 10, 2017. The top three designs will be selected & uploaded to the Georgia FFA Association Facebook for a statewide voting. The t-shirt with the most combined shares & likes will be selected as the winning design. All submissions are due via e-mail (georgiaffa@gaaged.org) by Sun, Sept 10, 2017. The winning design will be used as our annual FFA t-shirt for the 17-18 school year & your chapter will receive 15 free t-shirts. National FFA announced finalists for Proficiency Award, Agriscience Fair & National Chapter Award. Congratulations to these Georgia FFA Chapters & Members! 2017 Youth Educational Competition information has been posted online at http://georgianationalfair.com/youth-educational-exhibits/. Online registration will open August 1st. Deadline for entry is Wednesday, September 20th for FFA. Please contact Barry Norris with questions. This year we implemented a CDE Finals Hall at the State Convention. We have posted CDE Finals recordings to the Georgia FFA YouTube channel, along with a couple of other videos that were previously posted. Subscribe to our page and share the link. We hope to continue to post videos on our page that will help promote and educate about our program. If you have ideas for future postings on the Georgia FFA YouTube channel, please share them with the State FFA office. Watch online archives of the 89th Georgia FFA Convention! 35 Georgia FFA members are receiving $47,000 in scholarships! Congratulations to 35 Georgia FFA members who are receiving $47,000 in scholarships! American FFA Degrees due April 3rd! Attention Georgia FFA Members! 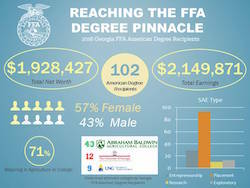 Georgia had a record 102 FFA members earn their American FFA Degree in the fall. Let's help Georgia FFA reach a new all time record -let's see if Georgia FFA can have 200 FFA members earn their American FFA Degree in 2017!! NEW Course Enrollment Trends Infographic! View the Georgia Ag Ed Course Enrollment Trends Infographic to compare statistics regarding the following high school courses: (1) Basic Agricultural Science (2) Ag Mechanics I (3) General Horticulture (4) Animal Science & Bio Tech (5) Forestry Science. Did you know? The Agricultural Education program helps students develop a "proficiency." Here's is a handy Proficiency Timeline Infographic for applying for awards! Georgia Proficiency applications are due February 1st. Contact your Region Office with questions! Please go https://www.ffa.org/scholarships for more information and eligibility. All FFA members applying for scholarships should login via their official FFA membership login (using invite code obtained from their FFA Advisor). On December 2-3, 2016, the Georgia FFA will hold our a state CDE day at ABAC in Tifton. Please review the agenda and be check email for more detailed information from the superintendent(s) of the CDEs. Tifton CDE Superintendents: Dairy Evaluation: Mr. Tommy Waldrop; Environmental/Natural Resources: Mr. Shawn Collins; FFA Quiz: Ben Lastly; Farm Business Management: Mr. Ira Tucker; Floral Design: Mrs. Trisha Lastly; Job Interview: Mrs. Erin Nessmith; Tractor Operations: Mr. Jerry Stone. Please encourage your students to consider agricultural education as a career, because without them, there won't be enough ag teachers to keep our programs going. Use these resources to celebrate & bring awareness to the career of agricultural education, whether it's on Teach Ag Day or any day. For details on any of these activites, just click the link. 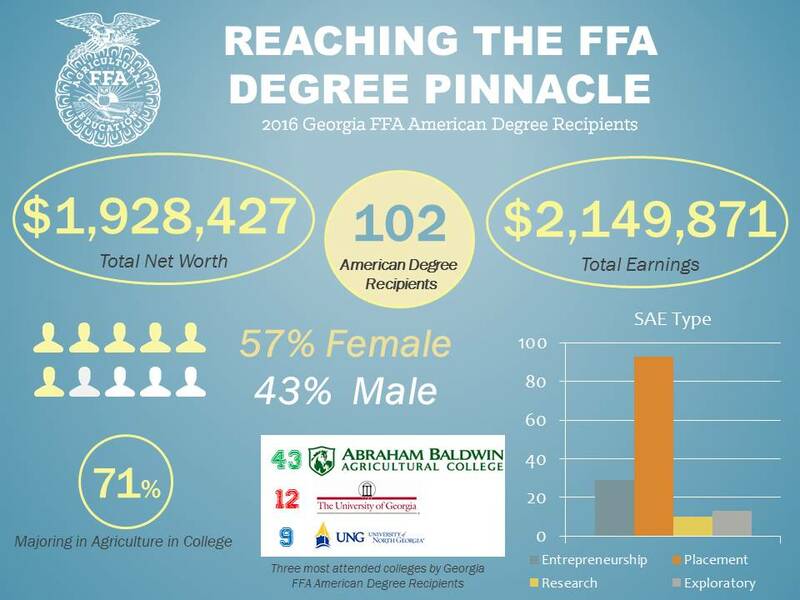 Georgia FFA is excited to announce that there will be 102 Georgia FFA members recognized for reaching the pinnacle of the FFA degree ladder. Congratulations to the 102 American Degree recipients from Georgia who will all be recognized on stage at the 89th National FFA Convention in Indy this October! COLT registration now open! This summer, we are offering two, 3-day, “retreat style” COLT Conferences in July that are open to any chapter in the state. COLT is available at the FFA-FCCLA Camp in Covington & at Camp John Hope in Fort Valley. Professional speaker, Ms. Patty Hendrickson will be in Covington & Mr. Patrick Grady will be at Camp John Hope. The 2016-2017 State FFA Officer team will be at both locations. Registration & full payment due June 17th. Thirty-one Georgia students were awarded National FFA Scholarships. Collectively these students will be awarded $50,000. Congratulations to these Georgia FFA members! The Georgia FFA Foundation, through generous sponsorship, is awarding a record number of 30 scholarships to the Washington Leadership Conference for 2016. The scholarship review committee received and considered 53 applications. Students that have earned a 2016 WLC Scholarship will be recognized at the State FFA Convention. Congratulations to the scholarship winners! State FFA Convention Online Registration website will close at 11:59 p.m. on April 1. After the site goes down, the only way to register will be onsite at the State Convention, and the chapter fee will increase to $300. Twelve State Stars were selected from over 700 Georgia FFA Degree applicants. The Star Farmer finalists are Jared Cook, Hayden Echols & Alyson Pope. The Star in Agribusiness finalists are Chandler Kudyk, De’Andre Wallace-Nash & Rhet Thornton. The Star finalists in Agricultural Placement are Cejay Heath, Makayla Holmes & Murdock Wynn. The Star finalists for in Agriscience are Hunter Corbett, Viral Patel & Rachel Solomon. Don't miss this fun opportunity to showcase Gerogia agriculture and compete for a trip to National FFA Convention in the Hall of Georgia Exhibit! The top 3 finalists are announced at the Career Show and the winner is is announced on stage during Friday's session. Entry forms due by March 15th. Contact Casey Shumate at 478-662-4692 or caseyshumate@gaaged.org with any questions. These videos were created by National FFA to help share the stories and experiences of members from across the country, the videos below are meant to be introductory educational and promotional resources about SAEs and the FFA experience. The students and advisors were interviewed at the 88th National FFA Convention. It is time to begin registration for the 2016 Greenhand Jamboree and 2016 Success Conference. Both conferences will be held March 4-5, 2016 at the FFA-FCCLA Camp in Covington. Registration and full payment is due postmarked to the state FFA office by Friday, February 12, 2016. Discovery Conference Registration now open! young members excited about the FFA & introduce students to the opportunities that FFA has to offer. Session: January 22-23, 2016, at the Georgia FFA-FCCLA Center near Covington. Check the Conferences & Convention link on the Georgia FFA website for more information. Registration due Deceember 15th! Visit FFA.org/convention to catch the highlights of the 88th National FFA Convention and Expo. Award-winners, stories, videos and more. National FFA SAE Grant Program - $1,000 to grow their SAE! National FFA offers access to a record $145,000 in funding for student SAEs through the SAE grant program. Help your students apply today! The process is a simple online student developed application; you then review and submit to the National FFA Organization. Students can access the SAE Grant Application directly from their Degree Application Manager in FFA.org. Reminder that our Fall deadline for having students (and their courses) listed for Enrollment data & your roster/dues submitted to be considered for 100% FFA membership is October 15. We have created a Step-By-Step guide to our new Enrollment/FFA Roster/Registration system. This document was handed out at Area meetings at the end of August and it is posted on our Georgia FFA site. Please don't hesitate to contact the State FFA Office, Region office or Mrs. Steinkamp if you have any questions or need help. The entry deadline for the State Market Steer & Beef Heifer Show is Thursday, October 1st. All FFA entries must be made online by the Agricultural Education teacher. Please contact your Area Livestock teacher with questions. North Region: Kent Benson at 706-552-4463. Central Region: Ricky Wheeler at 478-595-5351. South Region: Tommy Waldrop at 229-386-3196. The 2015 FFA Day at the Fair Middle School Program will be held on Tuesday, October 13, 2015, in Reaves Arena at the Georgia National Fairgrounds in conjunction with the Georgia National Fair in Perry. This activity targets agricultural education students and FFA members in grades 6-9 only and is designed to offer an interactive look at what agricultural education and the FFA have to offer. Registration deadline is Thursday, September 17, 2015. Contact Erin Nessmith (enessmith@gaaged.org) for information! National FFA Convention Registration is now open! The 88th National FFA Convention will be held October 28-31, 2015 in Louisville, Kentucky. National FFA Convention registration does not include rooms. Please refer to the National Convention Housing and Registration email from Mr. Lastly or contact the Georgia FFA Association office for more information. The National FFA Organization announced finalists for Proficiency Award, Agriscience Fair and National Chapter Award. Congratulations to these Georgia FFA Chapters and Members! The American FFA Degree is awarded to FFA members who have demonstrated the highest level of commitment to FFA. These FFA members will be recognized during the eighth general session of the 88th National FFA Convention & Expo. The ceremony will be broadcast live on RFD-TV and via FFA.org. Georgia has seventy-seven FFA members who have earned their American FFA Degree and will be recognized at the 2015 National FFA Convention in October. The deadline for the Living to Serve: Natural Disaster and Emergency Preparedness grant has been extended to Thursday, August 13. Middle school, high school and collegiate FFA chapters may apply for up to $2,000 to develop a yearlong service-learning project to respond to environmental needs resulting from a natural disaster or to explore the needs of their school/community to be prepared for natural disasters. Visit www.FFA.org/envirogrants to apply today. The entry deadline for the State Market Goat & Market Lamb Show is Saturday, August 1st. All FFA entries must be made online by the Agricultural Education teacher. Please contact your Area Livestock teacher with questions. North Region: Kent Benson at 706-552-4463. Central Region: Ricky Wheeler at 478-595-5351. South Region: Tommy Waldrop at 229-386-3196. The National FFA Organization is announcing a one-time grant opportunity for FFA chapters to develop a year long service-learning project to respond to environmental needs resulting from a natural disaster or to explore the needs of their school/community to be prepared for natural disasters. Middle school, high school and collegiate FFA chapters may apply for up to $2,000. Go to www.FFA.org/envirogrants to apply today or register for an informational webinar. Applications are due August 7, 2015. Georgia FFA is proud to offer the opportunity to the following students to serve as delegates for Georgia at this year’s national convention: Laura Alton, Elizabeth Beacham, Emily Brogdon, Ashley Burton, Justin Daniel, Sydney Dyer, Matthew Holton, James Holton, Connor Johnson, Sadie Lackey, Autumn Lankford, Lexie Reynolds, Hunter Stillwell, Peyton Sweet, Travis Tankersley, Caroline Waldrep, and Matthew Tyler Wise. These 17 students were selected from 36 applicants submitted for consideration. 2015 National FFA Convention Band, Chorus and Talent are now live on www.ffa.org on the Band, Chorus and Talent page as well as within the toolbox of the student and instructor. In order to apply, members will need to fill out an online application, submit an audition video, and pay a $25 application fee. Applications are due Friday, July 10, 2015. Members will be notified of their application status by Friday, August 14, 2015. Georgia FFA members "Living to Serve"
During the State Convention, nearly 300 FFA members and advisors lived out the Living to Serve portion of the FFA motto by participating in a community service program with the Rebuilding Macon organization. Thank you to all the chapters who participated and Mr. Kevin Jump, community service coordinator for the effort in putting together a day of service. Georgia FFA is proud to announce 48 Georgia FFA members have been selected to receive $67,000 in National FFA scholarships funds for 2015. Scholarship award recipients will receive notification letters from National FFA in late May with detailed instructions for claiming their scholarship. Can't make it to Macon next week? Watch all the action from the 87th Georgia FFA Convention live online on April 23-25, 2015! Results are in! Congratulations to this year's state Agriscience Fair finalists & National Chapter Award winners! Congratulations to the 2015 State Star Finalists! The online Registration site for the 87th Georgia FFA Convention is now open. Registration is based on a chapter fee. The registration fee for each chapter is $250. That fee covers all FFA members, advisors & chaperones who attend. The online registration site will close at 11:59 p.m. on Wednesday, April 1. Once the site closes, the only way to register is onsite at the Convention. All onsite registration will cost $300 per chapter. All registration payment must be postmarked by April 10. Hall of Georgia Exhibit contest entries for the 87 Georgia State FFA Convention are due April 1. Please review the Hall of Georgia Exhibit contest rules for more information . The winning chapter will receive funds to help pay their way to the National Convention this October to represent Georgia in the Hall of States program. If you have questions, you can contact Ben Lastly or Casey Shumate. The Georgia FFA WLC bus trip is June 15-21, 2015. The student conference fee is $965 and the advisor fee is $1,055. This fee covers most meals, lodging, conference material, and bus transportation. All WLC registration material is due to the State FFA Office on April 1. Learn more on the WLC page of our website. If you are interested in more information or have any questions, please contact Hope Carter at (706) 552-4457 or hcarter@gaaged.org. Congratulations to the 2015 State FFA Proficiency Award finalists. These students will interview at the State FFA Convention on Thursday, April 23, and the state proficiency results will be announced live on stage during the 3rd general session of the 87th Georgia FFA Convention at 10:30 a.m. on Friday, April 24. An interview schedule will be announced on April 1. The deadline to submit WLC scholarship applications to your region office is March 10, 2015. FFA members should submit a copy of the WLC registration form along with their scholarship application. WLC scholarship priority is given to current 10th and 11th grade FFA members. Students who have previously attended WLC are not eligible to receive scholarships. All registration material for WLC is due April 1. Registration opens at 7:00 AM on Tuesday, March 3, 2015. 60 people registering for a single week. Go to GeorgiaSLC.org and click "Teachers" then click "Register" or scroll down. Due to recent severe weather, the deadline for submitting State Officer applications, State FFA Degree applications and Star Batteries has been extended to Friday, March 6. All applications and Star Batteries need to be completed (including, submitted both hard copy and electronically) and in the appropriate Region office no later than Friday, March 6.